Leaf blades oblong to ovate, obscurely crenate-serrate on the margins, smooth or somewhat hairy, especially toward the base of the petioles; the leaves and flower stalks arising from slender rootstocks or stolons. Flowering scapes 2 to 10 inches high, usually longer than the leaves. 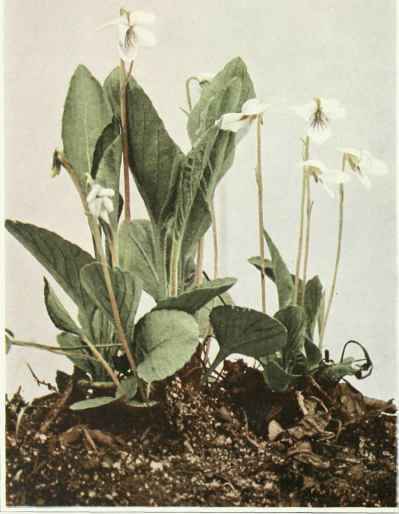 Flowers white, the three lower petals purple-veined, the lateral ones slightly or not at all bearded; capsules green; seeds reddish brown. Numerous leafy stolons are developed in late summer. A frequent violet of moist, open, especially sandy soil near the coast from New Brunswick to Florida and Louisiana. Flowering in May and June.